"Nous avons fait un beau voyage..."
These were the first words to be transmitted on French television at 8:15 pm on 22 April 1935. These immortal words were spoken by French actress, Béatrice Bretty. In English this famous line reads: We had a nice trip. This first line seems strange, since the television journey was only just beginning. But Bretty's first television words were actually her recounting a recent journey to Italy with a bunch of acting friends. 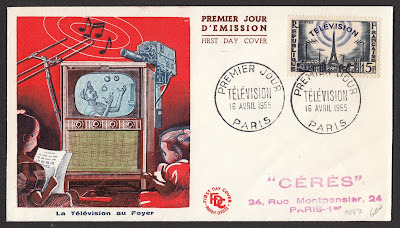 On 16 April 1955 France issued a First Day Cover commemorating the origins of French television. The stamp on the cover was designed and engraved by Albert Decaris. I have already done a blog on this stamp. Click HERE to take a look. The cover also has a beautiful cachet on the left side. Decaris designed a lot of cachets for French FDC's so I am assuming he also did this one. If anyone knows for certain one way or another please let me know. A few days ago I received a lovely gift from a stamp buddy. A copy of the First Day Cover mentioned above. It is awesome. Thank you so much, Natalie! I absolutely adore the cachet on this cover. it brings back memories from when I was little, sitting n front of the TV watching my favourite shows - in those days we still called them 'programmes'. Shows like Doctor Who, Gilligan's Island, The Brady Bunch. And cartoons like Bugs Bunny Show, Felix the Cat, and so so many others I'd be here for days listing them! 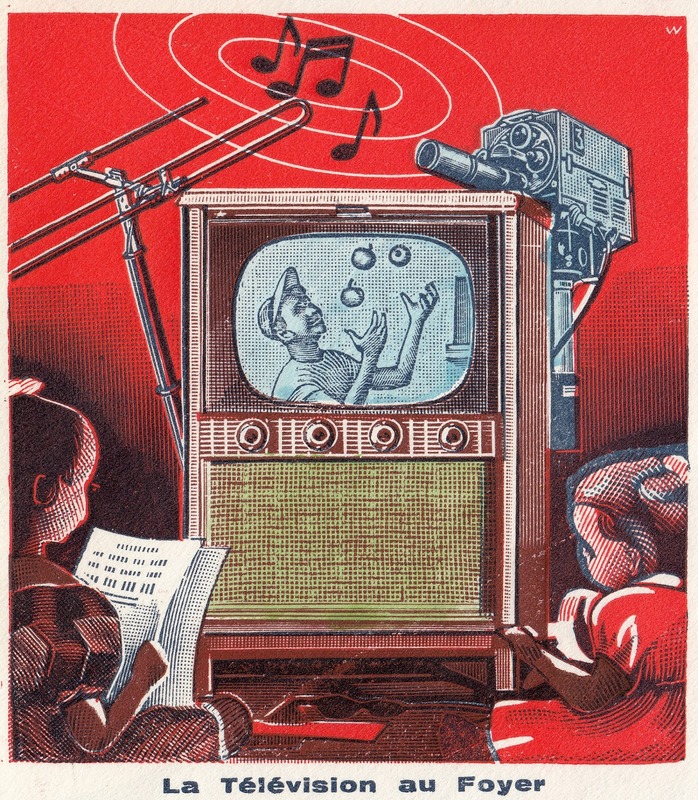 This cachet features two little kids sitting on front of the tele watching a children's programme, while in the background we see the mechanisms utilised to bring that show to their home. 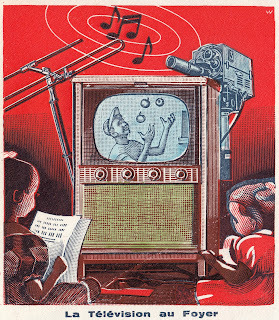 Indeed, the caption at the bottom of the cachet reads: Home Television.